Trinity Catholic goalie Jeff Reda defends against St. Joseph at Connors Ice Rink in Stamford on Feb. 6. With four games left in the regular season, Trinity Catholic still has hopes of being one of the 16 qualifiers for the Division III state tournament. The Crusaders are 4-13 overall and 3-7 against Division III opponents and are ranked No. 12 in Division III. There are eight teams below them as Trinity Catholic tries to finish in the Top 16. Trinity Catholic still has one Division III contest (Norwalk-McMahon) and one Division II game (Trumbull) remaining on its schedule. The arrival of Reda as a true No. 1 goalie has been three years in the making for Trinity Catholic. Three years ago, the Crusaders had a converted defenseman Zach Lockwood in net. 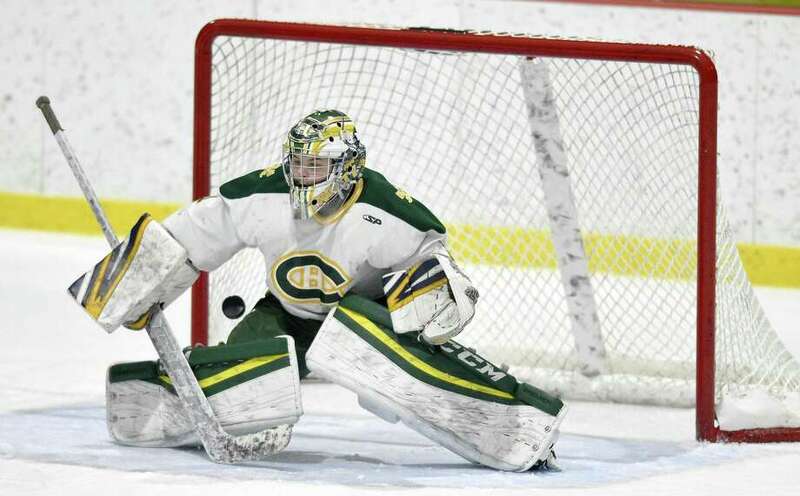 Last year, the CIAC had goalie Lance Lippmann sit out the opening 10 games before being allowed to play after transferring from Greenwich. Reda has played for a number of travel hockey teams before coming to Trinity Catholic. He was with the Westchester Express (AAA), the New Jersey Avalanche (AAA) and NJ Avalanche (AA). At Trinity Catholic, the 5-foot-7 Reda has been able to work with goalie coach Pete Pinto. Reda became passionate about being a goalie from the first time he put on the pads in his youth. Of course, his favorite goalie is Henrik Lundqvist of the New York Rangers. With just 12 skaters, Trinity Catholic plays two forward lines and two defense pairs. Quite naturally, the Crusaders are a tired group in the third period. Reda appreciates all the support he received from Trinity Catholic head coach Tucker Grose and goalie coach Pinto. Hockey is important to Jeff Reda. But education is more critical.